Less is more, until it isn’t anymore. The acoustic folk music of New Zealand’s Hollie Fullbrook and friends, aka Tiny Ruins, has that magical, transformative quality which can lift a mood in a flutter of heartbeats and guitar strings. From their incisive take on the oral storytelling traditions of 2011 debut Some Were Meant For Sea, to the slow, tenebrous beauty of 2014’s Brightly Painted One, Tiny Ruins has trodden a careful path of restraint, with some critics wondering if they had anything else to offer. Cue Olympic Girls, their satisfyingly unrestrained and courageous third album. Written by the same musicians as Brightly Painted One and produced by band member Tom Healy in the same underground space (Paquin Studios at The Lab in their hometown Auckland), this is unmistakably a Tiny Ruins album. Yet, there is a surprising immediacy to the music that makes itself known from the first lines. “Stirring, shaken, all of us waking under the same cover of sky”, sings Fullbrook, sounding resolute and confident in the wake of some unspoken drama. Pulling us up close to hear the rest of the tale, opening track ‘Olympic Girls’ goes on to set up the entirely different approach Tiny Ruins have taken on this album, finding creative freedom through letting go of control: “You’ll never find a thing / If you can’t lose yourself / Every once in a while”. It’s often been said that Fullbrook’s voice is made for storytelling, but here those stories don’t follow narrative norms. Instead, fragments of truth mingle with half-remembered conversations. Abstract concepts collide with rich, earthly imagery. All of it held in place by a compelling, singular vocal that recalls the timelessness and ambitions of Bryter Layter, or New Skin for the Old Ceremony. Like those albums, it delves much more into new textural ground, using vibraphone, upright bass, organs and lush orchestral flurries to tug at our emotions. If that sounds like high praise, it is, but it also reflects the sense that this album is a ‘keeper’ and one we’ll be returning to, often. Part of the charm of Olympic Girls lies in the layers of mystery in each song. Inspired by literature, science, nature and human experience, these mysteries lie waiting to be carefully unfolded, like a fragile love-letter hidden in the thumbed pages of a discarded paperback book. ‘How Much’ revolves steadily around a distorted psych riff, before woozily descending into a fever dream breakdown, as Fullbrook asks “how much would you be willing to give / how much do you take from all of this?” ‘Everything’ is the implied answer, leaving us with a lingering feeling that there is so much more to discover in this song alone. The tom drum shuffle and guitar arpeggios that intertwine and drive the energy of ‘Sparklers’ creates a similar, hypnotic effect, casting a love spell over the senses. Then, recent release, ‘Holograms’, eerily spins around our dreamy mood to face more serious existential questions, about the merging of humans and technology (all while fitting in a reference to a “Darth Vader novelty helmet”). The accompanying video, below, imagines a holographic world in which we are all intimately connected and where we cease to be individuals. ‘Kore Waits in The Underground’ and ‘My Love Leda’ tell a love-story from two sides, mixing Greek mythology and kitchen sink drama with open-eyed, childlike wonder, while ‘One Million Flowers’ takes inspiration from a Van Gogh painting, musically recreating the dance of flowers with their multichrome halos glittering in the sunlight. After repeat listens, Olympic Girls keeps giving up its secrets. You can imagine this album being a travelling partner, a soundtrack to long walks and rambles through undiscovered countryside, or simply one to sit quietly with in the slow comfort of your unravelling thoughts. The last two songs, in particular, hint at a world beyond our current understanding and possibilities yet to be dreamed of. ‘Stars. False. Fading’ has an enticing guitar hook, with vocal cadences that swell and break like waves drawing our ship deeper into the darkness of the ocean, only to leave us hanging gorgeously at the track’s ending. ‘Cold Enough To Climb’ signals the end of one journey and the start of another, falling into the arms of a loved one. Its flutes and strings barely defy the weight of fatigue felt through the weary beat, evoking a warmth and sense of connection. 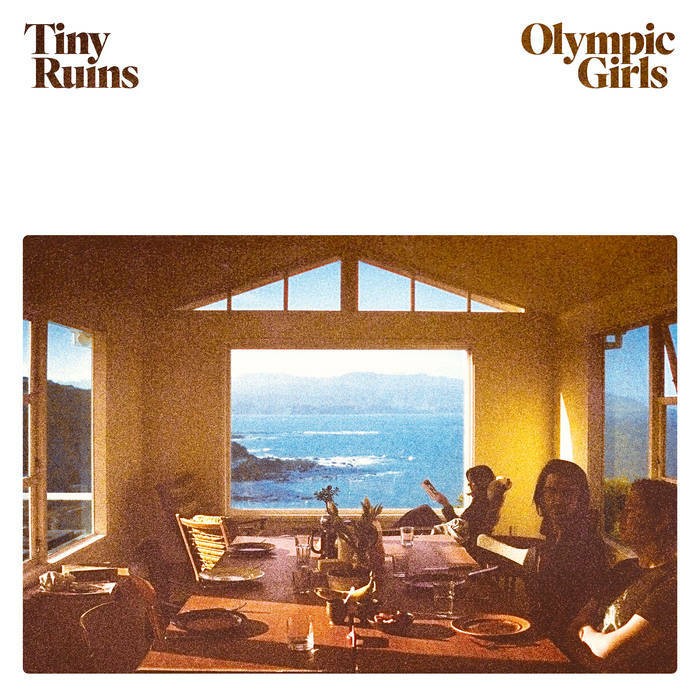 So, there it is, Olympic Girls is a most welcome return for Tiny Ruins. By throwing everything into its creation, reflecting on the distance travelled (quite literally while on tour last year, as well as emotionally), they have produced some of their finest songs to date. And, it feels like there’s maybe more to come, just around the corner. Olympic Girls is released on 1st February through Marathon Artists (UK/EU), Ba Da Bing Records (North America) and Milk! Records (AU).